Yesterday (26th of July 2015) I completed my first half marathon. The timing was terrible, I took 3 hours and 6 minutes according to the official clock, 3 hours and 3 minutes according to my mobile phone and 3 hours and 5 minutes according to my watch, either way one thing is certain, it was over 3 hours (which in runners parlance is “He is a beginner”). BUT, there are a few things that I am proud of and they are worth mentioning, I completed the run without having any pains at the end of it, I managed to run around 2 kms the following day at a blistering pace of 6 min/km!, I feel fine and am ready for a run tomorrow! Now that for me is the biggest achievement, to finish a half without injury after an injury! My running career started in the year 2004, I was working in Bangkok and my dear friend Victor Sachayan asked me to run a 7K with him in the Bangkok marathon. I had no clue about running 7K and a few weeks before the D Day I asked a friend Dr Paul about running. He very kindly helped me practice in the Ramkamhang stadium in Bangkok and every evening I ran a few kms. On the D Day, I woke up early, took a red bull (believing that it would give me wings) and also ate an apple. I remember the start and about 500 mts till I ran with my friend Varin, after that I remember running with some really old people who motivated me to push and then I had to finish within 45 mins for a medal, so somehow I made it and got my medal, the last thing I remember was I threw up the red bull after getting my medal! …. After that I did not run for a good 2-3 years, I came back to India and tried to run only to find out that the dogs of T Nagar were not used to runners and chased me spontaneously. I concluded that Running was not meant for Indians and switched to a sedentary lifestyle with occasional cricket and plenty of Carbs. It was the year 2007 when I was reading the papers and spotted that there was a marathon being organised in Chennai by Marg, A few colleagues and I decided to Run, some film stars were inaugurating the run (It was Naintara and Napolean If I am not mistaken). Man, what an experience that run was, we gathered at the start point, it was to be a 7 or 8 km run from War memorial to Lighthouse, there were thousands of people and when the race was declared open, no one would move as the crowds were mesmerized by the presence of Naintara. After wading our way through the (ec)static crowds, we then had to run through an ocean of Hawai Chappals (turns out many people turned up for the marathon with flip flops and naturally they got cut and were left behind on the road), then somewhere along the marathon I spotted sponsors giving away free T shirts, people running stopped and stood in queues to take free T Shirts … A few people even decided to take auto rickshaws and go to the end point! a completely different experience! Then came 2014, I visited Kochi on a work meeting and met a bunch of energetic young people (James Mathews and his team) who were setting out on a journey to help children learn leadership through sports and fitness in life. I was so inspired by what I saw that I decided it was high time I brought about some change in my own life and had to set an example to my own children. 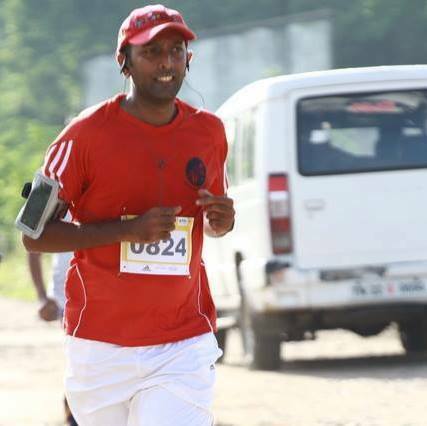 I then heard about a marathon through my good friend Prashant Sankaran and team were organising and signed up for a 10K, I practiced for a few weeks prior to the marathon and completed it in 1 hour and 25 minutes. I had pains for the next few days but did not want to stop now. I continued through the year and did several 10K’s and improved my timing to 1 hour and 12 minutes. In spite of doing all of this something did not feel right, then came DRHM2015, I had to take this to the next level and therefore I registered for a half marathon (21.1 kms). I learned that Dream runners organised training camps across the city and I enrolled in the OMR area. This group truly helped take things to the next level. They taught me things which I did not know and inducted me into proper running. Basic stretches before and after the runs, strengthening routines and what not. I began running 7 / 8 kms comfortably and turned up for work the same day (something I could not have done before). And then it happened, an injury of the IT band. I took my friend Prashant’s advise and stepped back for 2 weeks, it was tough not do do any exercise with just a month to go for my 21k. Eventually I managed to do a 15k at 9min/km 2 weeks before the run before tapering down. On the 26th of July I completed my 21k without any injury. I ran 90% of the time and even though the timing was poor, I am happy I was able to complete it in the company of many friends and family. Looking back, there are a few things that really helped me achieve this, whenever I thought why I was doing all this, it was the thought of setting an example for my kids that drove me foremost. My group OMR Dreamers was a major inspiration, the fact that the mentors (Zainab Akil Master Venkat Venkataraghavan Anand Nott Suresh Bharathan Moorthy Govindrajan Govindarajan Krishnan Raja Sinha Rocking Vasanth) and many others who turned up at 5am in the morning wanting to impart training for no fee was priceless, I had to be there just to respect their commitment. My family motivated me a lot by supporting me in every possible way. Without all of the above nothing would have been possible. Now it’s time to keep the momentum on and strengthen myself more to achieve a more respectable timing.